Optimum Nutrition Gold Standard Pre-Workout provides energy and razor-sharp focus to perform at your best during your training. You want the best results from your nutrition and gym workouts. Increased training intensity helps maximizing your fitness goals and to up your intensity you need more energy. Each serving provides 175 mg of caffeine from natural sources which will increase your energy levels and improve your mental focus during training. No quality pre-workout would be complete without the addition of Beta-Alanine and Creatine which provide an increase in performance by improving endurance and strength. Gold Standard has both of these ingredients. Added vitamins B1, B6, B12 Niacin and Pantothenic Acid contribute to normal energy-yielding metabolism, which when combined with caffeine helps you train at your peak. Keeping with the high-quality that ON is known for this product is certified Banned Substance Free making it suitable for a wide range of athletes. Having a look at the nutrition information this is not the strongest pre-workout on the market. It is designed for fitness enthusiasts looking for a smooth boost to their training or those who are sensitive to large doses of caffeine. 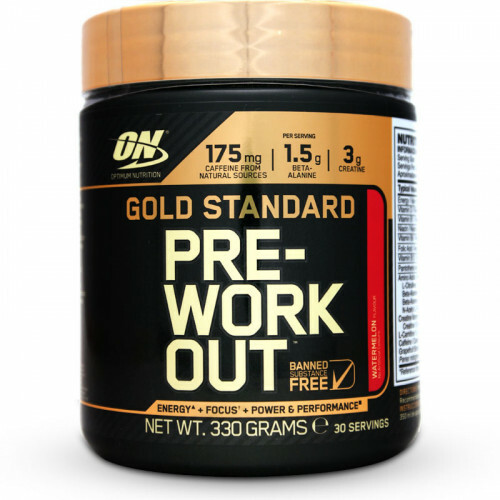 Optimum Nutrition Gold Standard Pre-Workout is another well formulated and effective pre-workout drink from a company known internationally for their premium fitness supplements. Creatine Monohydrate, Amino Acids (L-Citrulline, Beta-Alanine as CarnoSyn, N-Acetyl L-Tyrosine), Acidity Regulators (Citric Acid, Malic Acid, Tartaric Acid), Flavouring, L-Carnitine, Vitamins (Pyridoxine Hydrochloride, Nicotinamide, Calcium D-Pantothenate, Cyancocobalamin, Thiamin Hydrochloride, Cholecalciferol, Pteroylmonoglutamic Acid), Grapefruit Bioflavanoid Complex, Natural Caffeine, Thickeners (Cellulose Gum, Xanthan Gum, Carrageenan), Anti-Caking Agents (Silicon Dioxide, Calcium Silicate), Sweeteners (Sucralose, Acesulfame K) Panax notoginseng Root Extract Powder, Colour (Beetroot Red). Allergen Information: May Contain: Milk, Soy, Gluten, Egg, Nuts and Peanuts. • Mix 1 level scoop (11 g) in 350 ml of cold water. • Take one serving 15 – 20 minutes before your gym session. • Recommended consumption is 1 serving per day. Consult your physician before using this product if you are taking any medications or are under a physician's care. Only intended to be consumed by healthy adults 18 years of age and older. Not recommended for those that are sensitive to beta-alanine or caffeine. Do not consume caffeine from other sources while taking this product. Beta-alanine may cause a harmless, temporary tingling or flushing sensation. Do not consume with alcohol.